Among its many amazing applications, Google now has web-based alternatives to many of the applications in Microsoft Office. This comprehensive and easy-to-follow new book enables you to explore Google's new office applications in detail. Once you do, you'll be in good company - more than 100,000 small businesses and some corporations are already looking to take advantage of these free Google offerings. Google Office: The Missing Manual teaches you how to use three relatively new applications from Google: "Docs and Spreadsheets", which provide many of the same core tools that you find in Word and Excel; and Google Calendar and Gmail, the applications that offer an alternative to Outlook. This book demonstrates how these applications together can ease your ability to collaborate with others, and allow you access to your documents, mail and appointments from any computer at any location. Many of you already use Gmail, but do you know its full potential? Do you know how you can increase its power by using Gmail with Doc and Spreadsheets and Google Calendar? 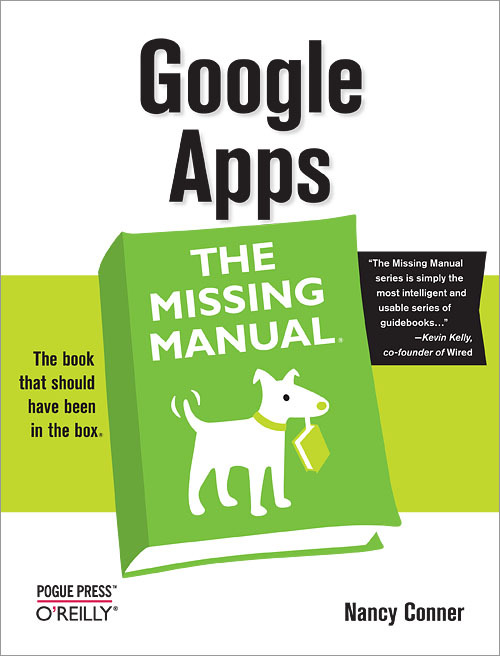 You'll find out with Google Office: The Missing Manual. You'll also come to understand why large corporations such as General Electric and Proctor & Gamble are taking a long, hard look at these applications. Nancy Conner has a PhD in English from Brown University and has taught writing, including technical writing, to college students for more than a dozen years. She is currently a freelance copyeditor, specializing in technical books covering topics ranging from the MS Office suite to programming languages to advanced network security. View Nancy Conner's full profile page.